To get more traffic and page views you obviously have to improve your blog's SEO. So, that's why you can't neglect checking keyword ranking and position. Though you are not SEO Professional but still its really very mandatory to check Google Keyword ranking for targeted keywords to come on first few pages of Google. Google mainly follows 2 things in showing search results. 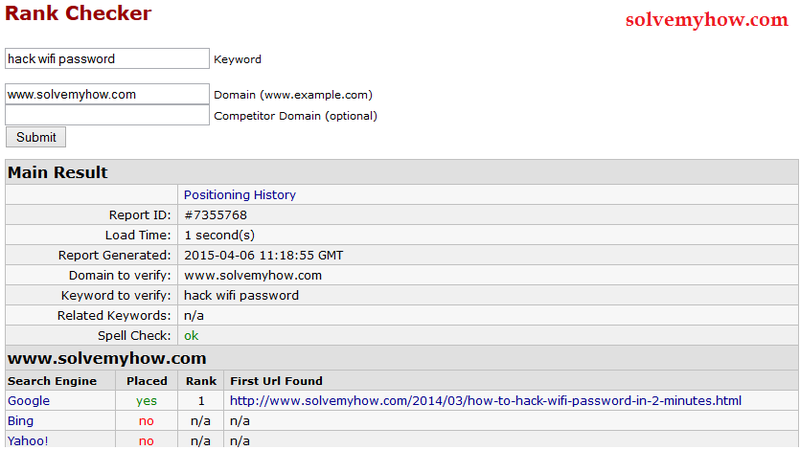 First "quality backlinks website has" and second "Keywords used in the post". So to come in top Google search results you must write articles by targeting keywords. It hardly takes 5-10 minutes to use Google keyword search tool and you can analysis the proper keyword. After selecting the targeted keyword your task is not done. You also have to check keyword position in Google search. So at this moment you need some tool which can tell you where specific keyword ranks in Google. So, that's why we have complied the list of free keyword rank checker tools to get rid of this issue. Google rank checker is an excellent free online tool which helps user to track the keyword position in Google search results. To use Google rank checker tool you just need to enter specific keyword in the keyword field along with the domain of your website and it will tell you the position of that specific keyword in Google search results. SEOCentro rank checker is the best and my favorite tool to check keyword position on the top 3 search engines i.e Google, Bing, Yahoo. Yes with SEOCentro you can check the performance of specific keyword in multiple search engines. It will give you the complete details of a specific keyword along with its rank, place and competition. Serps.com is another free tool to check keyword ranking on Google and Yahoo. It support these two search engines. You can analyze the local searches made on specific keyword by setting city or zip code of the city. It currently supports 100 countries. Small Seo Tool has very excellent UI. 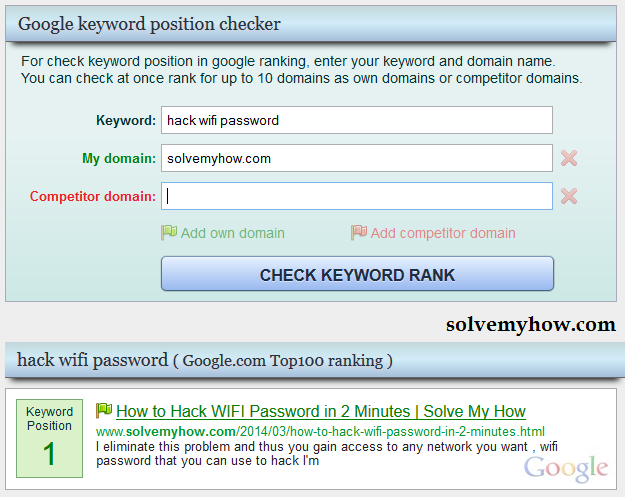 To use it you just have to enter your domain in "Your Domain" field and then you can enter upto 20 keywords at a time. It is very fast and give you the result of top 3 search engines i.e Google, Bing, Yahoo. You can also set the page range look at the snap shot below. Moonsy is a very excellent free online tool available to check keyword position in Google results. What makes moonsy different from other is that you can compare your competitor's position too. Moonsy is well known for its clean search page with the functionality to add more than one domain of yours as well as your competitors to check rank of same keyword on Google. Bonus :- An excellent android app called SEO Scores. In which you can add multiple keyword's to check ranking in search engine. It also has inbuilt backlink checker tool and on page SEO techniques tool. You can also compare backlinks with backlink comparison tool. So, android users can try this app too. So, this was all about top 5 online Google keyword ranking checker tools. It won't take much time to analyze keyword's and checking its position. Which will definitely help you in getting more traffic from search engines. If you found this article helpful then please share it with your social media friends. So they come to know about these free tools. 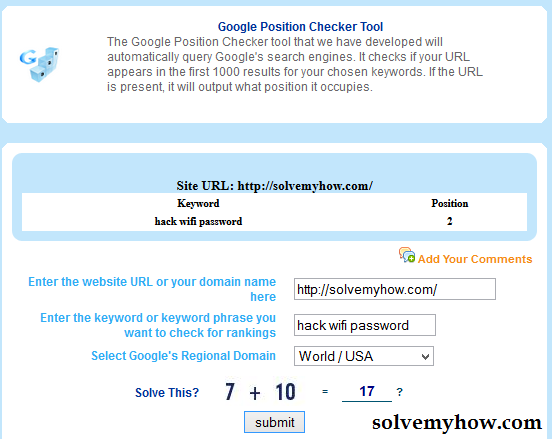 Do let me know if you know any other keyword position checker tool which works for you via comments. Nicely done. Has anyone heard about Rank Tracker Tool? Any experiences? The link is http://www.ranktrackertool.com. Yes, I've heard about Rank Tracker Tool but I would highly recommend you to use SEOCentro Rank Checker Tool. Hello Sir, How can i access Google Keyword Planner Tool, When i goes to adwords.google.com/keywordpalnner it takes me to create ad campaign page, i dont want to create ad just want to use planner tool ? and go to tools >> Keyword planner. Keep Visiting and don't forget to share this post with your social media friends. so what should i do, i dont wanna create campaign i just want to use tool ?